Western observers of relationships within the Gulf Cooperation Council (GCC) tend to view them through the prism of their own legal-rational processes, taking official professions of amicability, solidarity, and unity of vision and mission at face value. Reality, however, is quite different. Relations between Saudi Arabia and the United Arab Emirates (UAE), the GCC's two leading states with a modicum of military muscle, have been anything but amicable despite their close economic ties, with both leaderships finding it difficult to transcend their egos, biases, and personal politics in favor of the national interest. At best, they have managed to hide their hostility and rivalry behind a thin veneer of hospitality and politeness, as vividly illustrated during their 2017 collaboration against Qatar. While Riyadh's animosity toward Doha revolved around the latter's support for the Muslim Brotherhood and Hamas and strong relations with Erdoğan's Turkey, Abu Dhabi sought to cut Qatar down to size before its growing economic prowess overshadowed the UAE's business model. Despite this show of cooperation, the two states are more often than not in competition in the political and economic spheres. 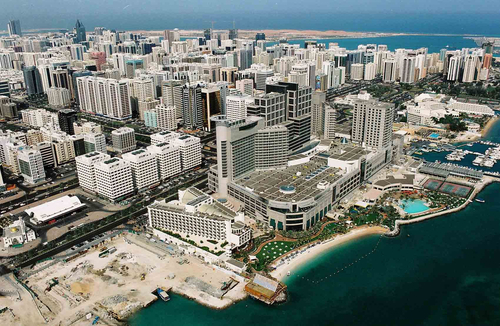 The United Arab Emirates' capital, Abu Dhabi, on the Persian Gulf. Since its creation, the emirates have had to grapple with formidable security challenges from their Arab and Iranian neighbors and have been overburdened with territorial disputes. When the UAE came into existence in December 1971, Riyadh achieved its objective of excluding Qatar and Bahrain from the new federal state. Tremendous Saudi pressure forced the UAE to sign the 1974 Treaty of Jeddah that ceded claims to the Khor al-Udaid inland sea that linked it to Qatar. Riyadh refused to recognize the UAE's independence until its president, Zayed bin Sultan, signed the treaty under duress although the UAE has not yet ratified the treaty. When UAE head Khalifa bin Zayed took office in 2004, he visited Riyadh and demanded the treaty's abrogation, ushering in an explosive crisis between the two states that took six years to subside. Emirati officials viewed the hostile Saudi behavior as another siege: Since its creation, the Emirate has had to grapple with formidable security challenges from both its Arab and Iranian neighbors and has been overburdened with territorial disputes from the beginning. Iran seized the Abu Musa and Lesser and Greater Tumb islands; Oman established its sovereignty over Buraymi Oasis while Saudi Arabia completed the UAE's diminution by cutting it off from Qatar. Because the UAE was a relatively small state, its leaders recognized that defending the country's security from both internal and external threats depended on skillful management of diplomatic relations with other countries. Saudi efforts to prevent the UAE from becoming a competitor in the GCC have succeeded despite the UAE's soft power. Thus, for example, in December 2004, Riyadh vetoed a Qatari-UAE plan to construct a causeway to link Abu Dhabi and Doha without having to travel through Saudi territory. Prior to the rise of the Iranian Islamic Republic in February 1979 and the outbreak of the Iraq-Iran war in September 1980, the small Gulf states determinedly resisted Saudi pressures for bilateral security and defense agreements as well as the settling of their border disputes on Riyadh's terms. They were mostly able to hold their ground against Saudi aggressiveness thanks to huge oil reserves and U.S. and British interest in their wellbeing. The impetus behind the GCC's formation in May 1981 came from Riyadh. Overwhelmed by a Shiite uprising in Qatif in November 1979 and the Great Mosque of Mecca seizure a few weeks later, the Saudi royals concluded that they needed to form a regional body for collective security. The official justification for the move stressed the need for achieving unity of the member states given their similar political, cultural, and religious identity as well as their common goals and aspirations. The real reasons for the GCC's formation, however, lay in the momentous developments in the Middle East during the 1970s. These included the power vacuum in the Gulf attending the departure of the British in December 1971; the isolation of Egypt in the Arab world following President Anwar Sadat's November 1977 Jerusalem visit and the signing of the Egyptian-Israeli peace accord; and the collapse of Shah Mohammed Reza Pahlavi's regime in January 1979. Sensing their vulnerability and inability to influence events around them, the small Gulf states reluctantly agreed to join the Saudi-inspired GCC, hoping to protect themselves against uncertainties rather than accruing gains. 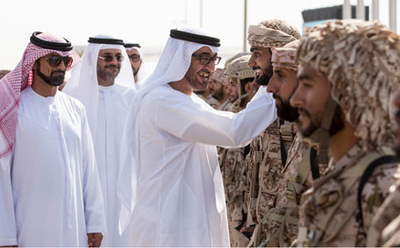 Muhammad bin Zayed (center), deputy supreme commander of the UAE armed forces, initiated an ambitious armament and military training program. In a few years, the UAE became a rising military power in the Middle East, enabling it to chart a foreign policy independent of Saudi Arabia. The UAE had deep concerns about Riyadh's desire to use the GCC to control smaller members because of the overwhelming imbalance of power. The Saudis perceived other GCC members as satellites in their sphere of influence, but their overbearing demeanor drew resentment from most GCC members. When Khalifa bin Zayed al-Nahyan took office in November 2004, he immediately challenged Saudi hegemony by acquiring a strong military and developing a forward-looking economy and dynamic foreign policy. This might explain why, for example, Riyadh frequently punishes UAE resistance to its condescending and domineering tendencies by causing excessive traffic jams at the Ghuwaifat border crossing for trucks bound for Saudi Arabia. It is not unusual for trucks transporting Emirati goods to line up for fifteen miles awaiting the completion of bureaucratic formalities. Doha's tenacious and persistent determination to pursue an independent policy line that often ran counter to Riyadh's expectations eventually drove Saudi Arabia with Emirati complicity to sever diplomatic and economic ties with Qatar and impose a land, air, and naval blockade on it in June 2017. The stunning Iraqi invasion of Kuwait in August 1990 shattered the myth of the GCC ability "to appeal to external powers, chiefly the United States, to preserve their military security." Enraged and scared by the unprecedented Iraqi action, the UAE opted for an active role in the U.S.-led coalition to liberate Kuwait and drive out the Iraqi army. The fall of Kuwait within hours (though intermittent resistance continued for several days) trivialized the Peninsula Shield Force, the joint military force of the GCC, and attested to its incompetence. The UAE's vigorous involvement in Operation Desert Storm in January 1991 further strengthened U.S.-UAE ties. In March 1991, during the military campaign to expel the Iraqi army from Kuwait, Egypt and Syria signed the Damascus Declaration with the GCC states to provide for their future defense against foreign enemies. The declaration failed to materialize because the mood in the Gulf had moved away from Arab solidarity or collective action toward identification with U.S. military prowess. When Riyadh decided to invest heavily in military acquisition, the UAE chose not to lag behind. As soon as Muhammad bin Zayed assumed the portfolio of deputy supreme commander of the UAE armed forces in January 2005, he realized that Washington would take the Emirate more seriously if it modernized its military. He, therefore, embarked on an ambitious armament and military training program, having concluded that the Peninsula Shield Force was ineffective and essentially untested. Not only had the GCC failed to integrate its members into a unified economic and financial bloc, but Peninsula Shield exposed gross ineptitude in protecting the territorial integrity of member states. National territorial integrity supplanted the concept of collective security, and the UAE abandoned military cooperation with other GCC states because it understood that Riyadh would dominate the council's functions. In a few years, the UAE became a rising military power in the Middle East, which enabled it to chart a foreign policy totally independent of its big Saudi brother. Its newly born self-confidence has prodded the Emirate to push for "redrawing its border with Saudi Arabia in the Empty Quarter to include 80 percent of the super-giant Shaybah oil field within its territory." The widespread belief that the Arab uprisings have given the UAE and Saudi Arabia "more than a common cause to take their relationship to another level" has been grossly exaggerated. To be sure, the uprisings compelled ‎Abu Dhabi‎ to cooperate tactically with Riyadh in order to insulate itself from impending threats to its national peace and order. But this cooperation did not imply a unified course of action or acquiescence in Saudi dictates. To this effect, in 2013, the UAE established a defense think-tank to develop a regional security doctrine and an Interpol-like GCC police command. To be sure, there were points of convergence and divergence between Saudi Arabia and the UAE in responding to the Arab uprisings. Both sided with Abdel Fattah al-Sisi's July 2013 coup that overthrew Egypt's Muslim Brotherhood (MB) president Mohamed Morsi and pumped in billions of dollars to stabilize Sisi's regime. They also joined ranks to crush the Shiite uprising in Bahrain. They fundamentally disagreed, however, on the events in Syria and Yemen. Whereas the UAE shunned any support to Islamist movements, Riyadh backed them as long as they did not threaten its internal stability. The MB in Egypt presented an ideological threat to Saudi Wahhabism, but Yemen's MB-affiliated Islah party did not. The UAE's deep concerns about the rise of Islamism had to do with the religious proclivity of the Emirates' armed forces. Religion is important for the UAE's indigenous population, and the Muslim Brotherhood, the only organized religious movement in the country, enjoys the support and respect of a considerable segment of Emiratis. If the UAE authorized general elections open to Brotherhood participation, the organization would have no difficulty winning 100 percent of parliamentary seats. In its efforts to legitimize Muhammad bin Salman's decision to go to war in Yemen, the Saudi media has been keen on describing UAE's participation in the Saudi-led Yemeni campaign as evidence of their strategic alliance: "All eyes, it seems, are fixed on the important and influential Saudi-Emirati axis." This is far from true: The decision to go to war in Yemen was made in Riyadh, and the UAE was unhappy about it. Instead, it makes sense to accept the claim that Saudi-Emirati policy coordination "exposes the GCC's institutional weak-ness." Their cooperation is tenuous, vulnerable, and opportunistic, and the professed intent to create a Gulf NATO remains "pledges and commitments ... on paper." On the occasion of King Salman's visit to the UAE in December 2016, Saudi ambassador to the UAE Muhammad al-Bishr described the two countries' relations as "exceptional and historical." He hoped, however, that the visit would draw together "the two countries' views on current developments in the region." The need to bring their views closer despite "exceptional" relations suggests serious divisions. These were confirmed when more than 150 Saudi and Emirati officials met in an inaugural retreat in February 2017 to strengthen bilateral relations following the establishment of a joint coordination council. According to the UAE, "The meeting was held to discuss fields of mutual interest and place general framework and plans for the council built to reflect bilateral cooperation between both countries and develop a new system of cooperation." The UAE, like other GCC member states, resents Saudi tutelage and big brother self-image. Saudi-Emirati relations were on edge "over regional issues and particularly over the rapidly unfolding events in Yemen." Disagreements were so intense that on the eve of launching Operation Decisive Storm in March 2015, Abu Dhabi's crown prince, Muhammad bin Zayed, had to wait for ten days before being granted permission to visit Riyadh and meet with King Salman and key royal officials. Yemen is an unsubtle arena of contest between the UAE and its larger neighbor. Riyadh considers preeminence in Yemen vital for its internal stability given that the Shiite Zaydis (to which the Yemeni Houthis belong) are well-established in the Najran and Jizan provinces bordering Yemen. Abu Dhabi regards success in establishing itself in Yemen as a unique opportunity to break the relentless Saudi effort to contain the UAE's ambition to establish itself as a maritime power in the Arabian and Red seas. The port of Aden, on Yemen's southern coast, is a major hub for cargo and regional transportation. The UAE wants to administer the strategic port and to ensure that it becomes an extension of Dubai and not of a competitor. The UAE worked to bring the defunct regime of former president Ali Abdullah Salih—before he was killed by the Houthis in December 2017—back to northern Yemen under the leadership of his son Ahmad, who commanded the elite republican guard. It has, moreover, encouraged greater activism by South Yemen's political and military secessionists. The pro-UAE commander of Aden airport security prevented Yemen president Abdrabbuh Hadi's plane from landing in February 2017. A subsequent brief meeting between Hadi and Abu Dhabi's crown prince Muhammad bin Zayed ended in failure when the former mentioned that UAE troops in Yemen were acting like occupiers. The pro-Emirates Aidarous Zubaidi, sacked as governor of Aden in April 2017, announced less than a month later the formation of a transitional political council to govern south Yemen. His sphere of influence includes the governorates of Hadramaut, Lahj, Shabwa, and Socatra, which are mostly controlled by the UAE and its local allies. A staunch southern Yemeni nationalist, Zubaidi is a former air defense officer who in 1994 fought on the side of the failed separatist attempt to restore the independence of the Aden-based People's Democratic Republic of Yemen. In 1996, he founded Harakat Taqrir al-Masir (Self-determination Movement) that carried out guerrilla attacks against the national army. His enthusiasm to pull the south out of the union with the north made Zubaidi a natural ally of Abu Dhabi, which is keen on breaking up Yemen. On the one hand, the UAE participates in the Saudi-led Operation Decisive Storm, while on the other, it supported until a few months ago the forces of the Houthis and former Yemeni president Salih. 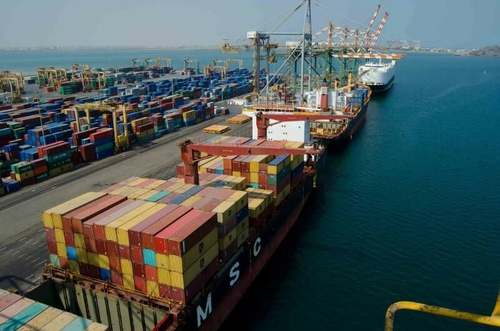 The UAE is interested in administering Aden's strategic port and wants to ensure that it becomes an extension of Dubai and not of a competitor. Its objective of controlling southern Yemen's coastline, which includes the strategic Bab al-Mandab Strait connecting the Red Sea with the Arabian Sea, cannot be achieved unless the south secedes from the union. Both Saudi and UAE societies and political systems are tribally based, and their ruling elites work to ensure that they remain closed not only to foreigners but also to other groups within their own national boundaries. They seem to think this is the best recipe to preserve the legitimacy of their traditional regimes in a rapidly changing world. It is difficult to imagine behavioral change under these time-honored precepts. Nor for that matter is there any realistic reason to expect the termination of conflict in the Middle East. Conflict is a way of life, and peace is an ephemeral aberration. Saudi and Emirati machinations and adventurism are ensuring that conflict lives on not only in the Gulf, but also throughout the entire region. Since the rulers in Riyadh and Abu Dhabi rely heavily on U.S. political and military support, one might hope that Washington would influence their behavior and moderate their aggressiveness. "Al-Mughamarat as-Saudiya al-Imaratiya fi-l-Yaman: Ayam al-Asal Intahat," masa-press.net (San'a, Yemen), Apr. 17, 2017. Bashir al-Bakr, "An-Niza al-Imarati as-Saudi ila Wajihat al-Qimma al-Khalijia," al-Akhbar (Beirut), Dec. 10, 2010. Susan Muaddi Darraj and Meredyth Puller, Creation of the Modern Middle East: United Arab Emirates (New York: Chelsea House, 2009), p. 39. Arabian Business (Dubai), Jan. 15, 2005; "Saudi-UAE relations: Economic Closeness and Political Divergence," altagreer.com, Dec. 4, 2016. Muhammad Sa'id Idriss, "Khayarat Sa'ba: Tahaddiyat al-Hukm as-Saudi al-Jadid wa Mustaqbal Majlis at-Ta'awun al-Khaliji," Arab Center for Research and Studies, Cairo, Feb. 28, 2015. Omar al-Hassan, "The GCC's Formation: The Official Version," Al-Jazeera Centre for Studies, Doha, Mar. 30, 2015. Marc Valeri, "The Gulf Monarchies and Iran: Between Confrontation and Geostrategic Realities," Centre for Gulf Studies, Exeter University, U.K., Apr. 3, 2012. Sa'id Idriss, "Difficult Choices: Challenges Facing the New Saudi Regime and the Future of the Gulf Cooperation Council," Arab Center for Research and Studies (Cairo), Feb. 28, 2015. Gulf News (Abu Dhabi), Apr. 3, 2012. Financial Times (London), June 5, 2017. Malteo Legrenzi, The GCC and the International Relations of the Gulf: Diplomacy, Security and Economic Coordination in a Changing Middle East (London: I. B. Taurus, 2011), p. 75. Lawrence Freedman and Efraim Karsh, The Gulf Conflict 1990-1991 (Princeton: Princeton University Press, 1993), p. 67. Maisie McCormack and Brandon Friedman, "Beyond Fraternity: The Kingdom of Saudi Arabia and the United Arab Emirates (UAE)," Tel Aviv Notes, Moshe Dayan Center, Tel Aviv University, Oct. 26, 2016. Pierre Bienaime and Armin Rosen, "The Most Powerful Army You've Never Heard of," Business Insider (New York), Nov. 6, 2014. Oxford Business Group (London), July 22, 2010. Fadi Aboualfa, "Saudi-UAE: The Start of a Beautiful Relationship?" Middle East Economic Survey (MEES), Nicosia, Jan. 19, 2015. McCormack and Friedman, "Beyond Fraternity. Arab News (Jeddah), Oct. 7, 2015. Mohammed Haider Ghuloum, "Weird Saudi War on Yemen, Reluctant Allies, A Ceasefire Prank," Arabia Deserta: MENA Focus, New York, Apr. 23, 2015. Arab News, Dec. 4, 2016. News release, Ministry of Cabinet Affairs and the Future, UAE, Abu Dhabi, Feb. 22, 2017. Valeri, "The Gulf Monarchies and Iran. Middle East Monitor (London), Apr. 5, 2015. Al-Quds al-Arabi (London), May 10, 2017. Intelligence Online (Paris), Sept. 28, 2016; Middle East Eye (London), May 3, 2017. The New Arab (London), May 11, 2017. "Saudi-UAE Relations: Economic Closeness and Political Divergence." Related Topics: Persian Gulf & Yemen, Saudi Arabia | Hilal Khashan | Spring 2018 MEQ receive the latest by email: subscribe to the free mef mailing list This text may be reposted or forwarded so long as it is presented as an integral whole with complete and accurate information provided about its author, date, place of publication, and original URL.